This week the Rosetta probe will release Philae to land on the comet 67P/Churyumov-Gerasimenko. It will be the first soft landing on a comet, but not the first probe to land on another world. Besides our homeworld, humans have walked on the surface of one other body and landed probes on five. If successful Philae will mark the 6th solar system object we’ve landed upon. The Moon was the first celestial body we landed on. The Soviet Union’s Luna 2 successfully impacted the lunar surface in 1959, and by 1966 Luna 9 made the first soft landing on the Moon. By 1969 the United States successfully landed Neil Armstrong and Buzz Aldrin as the first humans to walk upon another world. It was soon followed by five other manned missions. Since then there have been lots of lander and orbiter missions to the Moon, the most recent being China’s Chang 3 rover mission. The first successful landing on Mars was achieved with the U.S. Viking 1 mission in 1975. It was soon followed by Viking 2. These missions were the first efforts to discover life on another planet. In 1996 Pathfinder marked the first rover on Mars. Today the Curiosity rover continues that tradition. Europe, Russia and India have all had successful mission to the Red Planet. 1975 also marked the first landing on Venus with the Soviet landers Venera 9 and 10. There have been several flyby missions and a few orbital missions since then, but the Veneras mark the only successful landings on Venus. Given the extreme temperatures and pressures of the planet’s surface, that’s not entirely unexpected. 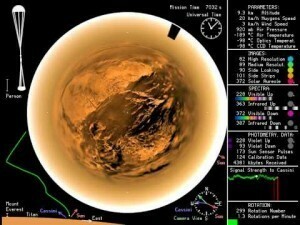 In January of 2005 the Huygens probe entered the atmosphere of Saturn’s moon Titan. It landed on the moon’s surface about two and a half hours later, sending images and data back to the Cassini orbiter, which relayed the data to Earth. Though much colder, the surface and weather of Titan is somewhat similar to Earth’s, with lakes and seasonal changes. They are just lakes and clouds of methane and ammonia rather than water. Titan marks the most distant world we’ve ever landed upon. Later that same year Japan’s Hayabusa probe landed on the asteroid 25143 Itokawa. The goal of the mission was to gather samples of the asteroid for return to Earth. The sample mission failed, but dust captured by the probe was successfully returned to Earth in 2010. Now this week we will at a comet to this list. It’s pretty amazing when you think about it. We humans are not bound to our homeworld. We’ve begun to step out into space, and our efforts are getting better and more common. What about the improvised soft landing of NEAR-Shoemaker on Eros in 2001?